LED video manufacturer introduces impact and scratch resistant technology to dramatically increase the longevity of ultra fine pixel pitch LED displays. 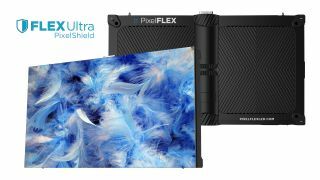 The What: Created to overcome the challenges associated with the protection and performance longevity of ultra fine pixel pitch LED displays, LED video manufacturer PixelFLEX has introduced the new FLEXUltra with PixelShield. A true COB technology, PixelShield offers an industry-leading impact and scratch resistant coating for FLEXUltra displays and provides a dramatic increase in the protection of the high-definition LED video experience. The What Else: Utilizing the impact and scratch resistant COB PixelShield technology, FLEXUltra is designed in a convenient 16:9 ratio and has a 160-degree horizontal and vertical viewing angle. With fully font-serviceable panels for quick and easy onsite installation and maintenance, FLEXUltra operates with a 3840Hz refresh rate to eliminate on-camera scan lines and flicker, and is available in 0.9mm, 1.2mm, 1.6mm and 1.9mm pixel pitch options.